Recently I had a holiday off no one else seems to have, so of course I took advantage of it and spent all day hiking! 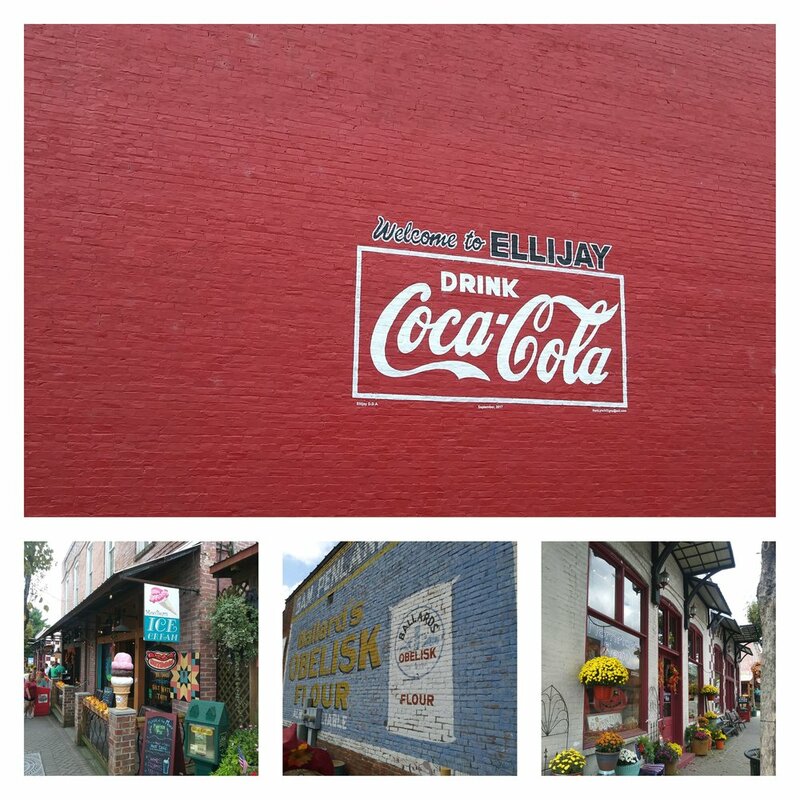 I went up to Ellijay, a place I hadn’t been to lately (other than for work). James and I used to come to Ellijay quite a bit when we still lived in Cherokee County, since it’s a pretty easy drive from there. There are so many great places to explore. We love Cartecay Vineyards, the quaint downtown area, and of course, all the hiking nearby! On this day, I woke up really early and decided to hike at the Bear Creek Trail just outside of town. I call this area “the Cohutt-ish”. 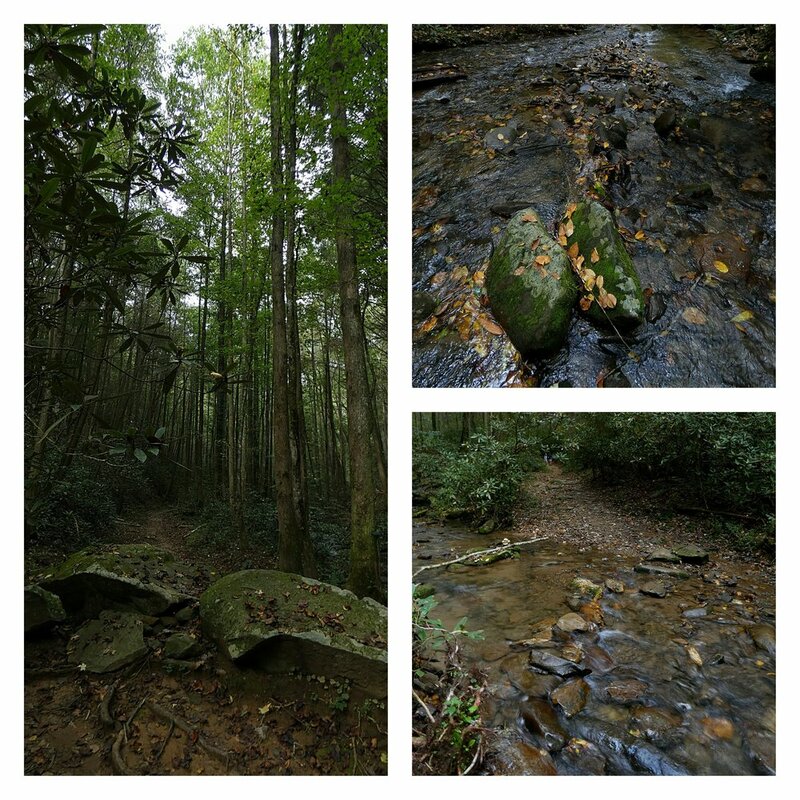 It is within the Cohutta Wildlife Management area, but it’s not really within the Cohutta Wilderness itself. Regardless, it’s a beautiful, lesser traveled area that feels like a gateway to the actual Wilderness. James and I came here a few years ago with the dogs and I really liked it. It’s got a little bit of something for everyone. 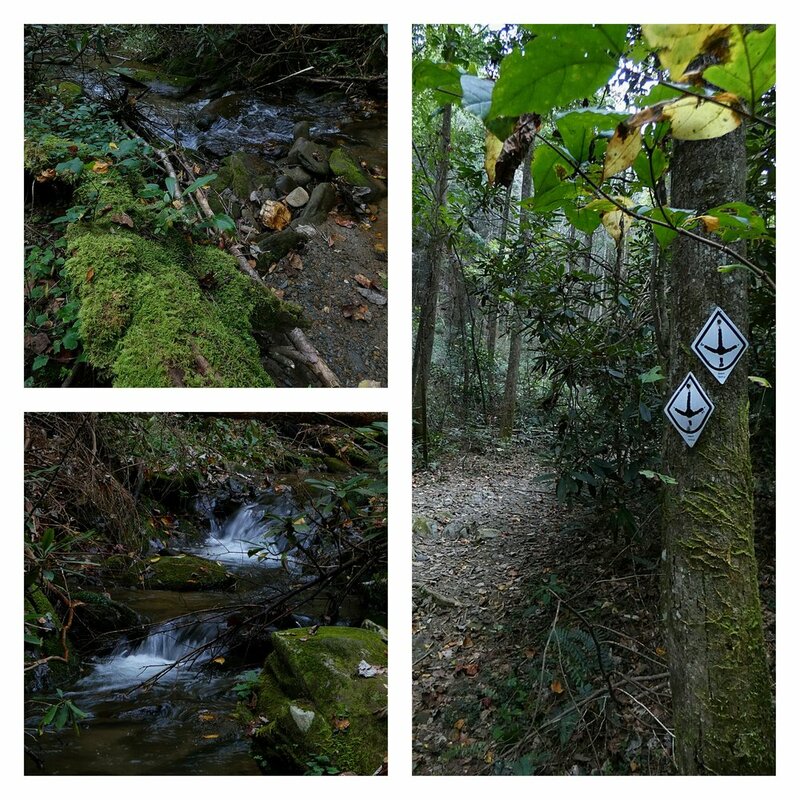 It’s a great trail for dogs and it’s also very popular with mountain bikers. There’s a campground located nearby as well. There’s also a historical aspect (more on that later). The trail network here is pretty extensive, so I’d recommend studying a map before setting out. Even though I did this, I still took a wrong turn and my hike ended up shorter than I planned. Obviously it could have gone the other way as well! The trailhead is also located a couple of miles down a gravel road. We’ve driven it in a sedan before, but if it’s muddy, it could be difficult. I intended to do the 7 mile loop option and I began at the side of the trail near the sign indicating “Bear Creek Loop”, near the creek. The other option is to start the trail near the large bulletin board at the end of the parking area. The creek is small and shouldn’t present a problem when crossing. The trail then goes consistently uphill for probably a mile. I knew this and wanted to get some exercise, which is why I started here. The trail then follows a wide, road-like path through several large clearings. I don’t mind road walking, but this part doesn’t have the most interesting scenery. I do find there to be something peaceful about walking on an untraveled gravel road, though. Eventually the road reaches an intersection with the Pinhoti Trail and I think this is where I took a wrong turn and trended back down the trail in the direction of the parking area. Before I knew it, I was at the Gennett Poplar, which is definitely the centerpiece of this trail. 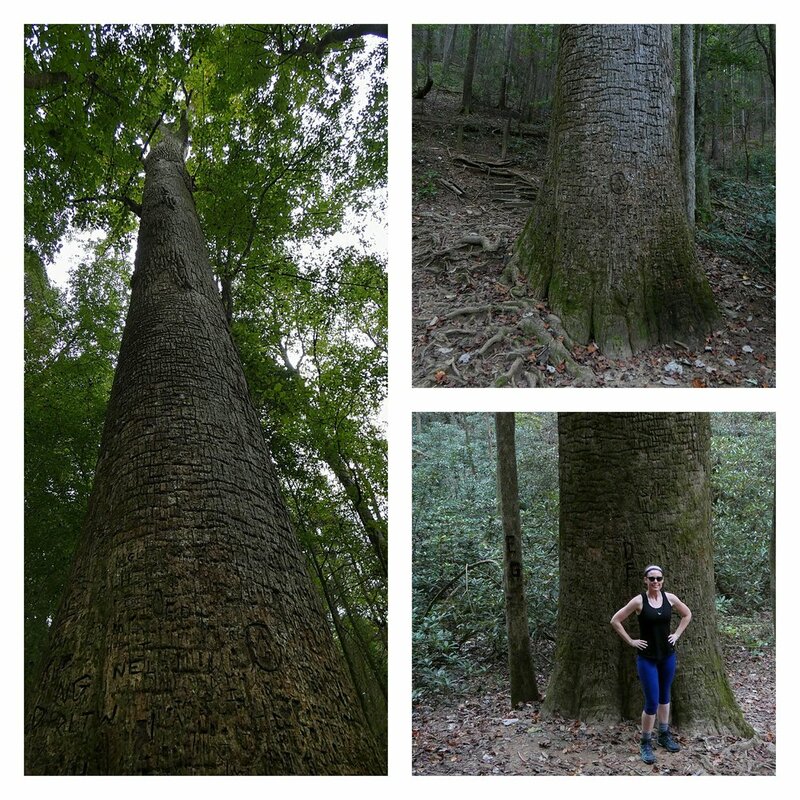 The Gennett Poplar is the second oldest tree in Georgia and it is impressively huge. Granted, I’ve never seen redwoods or anything like that, but for trees in my neck of the woods, it is very impressive. Unfortunately, there are a lot of carvings in the tree. Carving can damage trees and even kill them. My dog has actually chewed on tree branches in the yard and killed a few small trees! 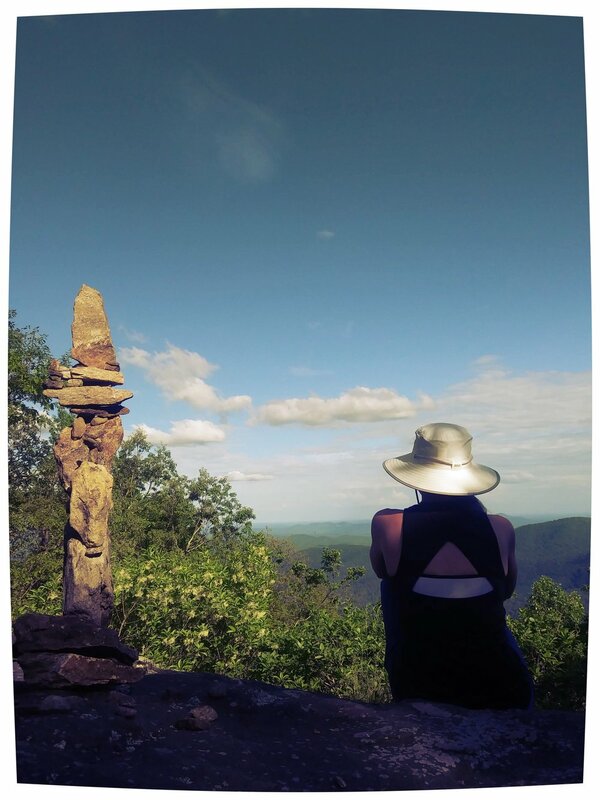 The Gennett Poplar survived the de-forestation of North Georgia in years past, so it would be shameful to lose it to something as stupid as carving. There is a large open area near the tree, right along the stream so this is a good spot to stop and eat lunch or just relax. I could put a hammock up and stay here all day, but I had other things in mind to do around Ellijay. So I continued to down the trail back to the parking area. This side of the trail is actually a little more scenic than the first part. The creek is more prevalent and I actually saw a salamander in the water. After the poplar, it’s not too far back to the trailhead, so if you’re looking for a shorter hike and want to prioritize seeing the tree, start the opposite of the way I did. 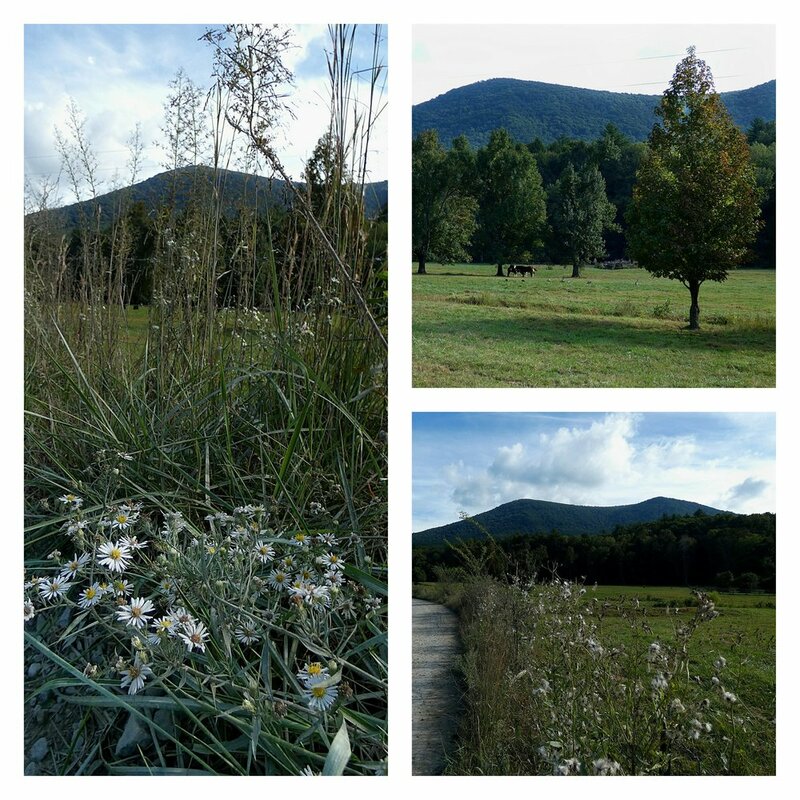 After finishing at Bear Creek, I went into Ellijay and walked around for a little while. I love Ellijay. It was really the first mountain town I got acquainted with after Dahlonega. Some places were closed because it was a holiday, but I grabbed lunch at the Back Porch Bistro before heading onto my next destination. A while back, James and I were planning to visit Fall Branch Falls but circumstances didn’t allow it, so I decided to go back on my own. We’ve hiked in the area before but never actually seen the falls. 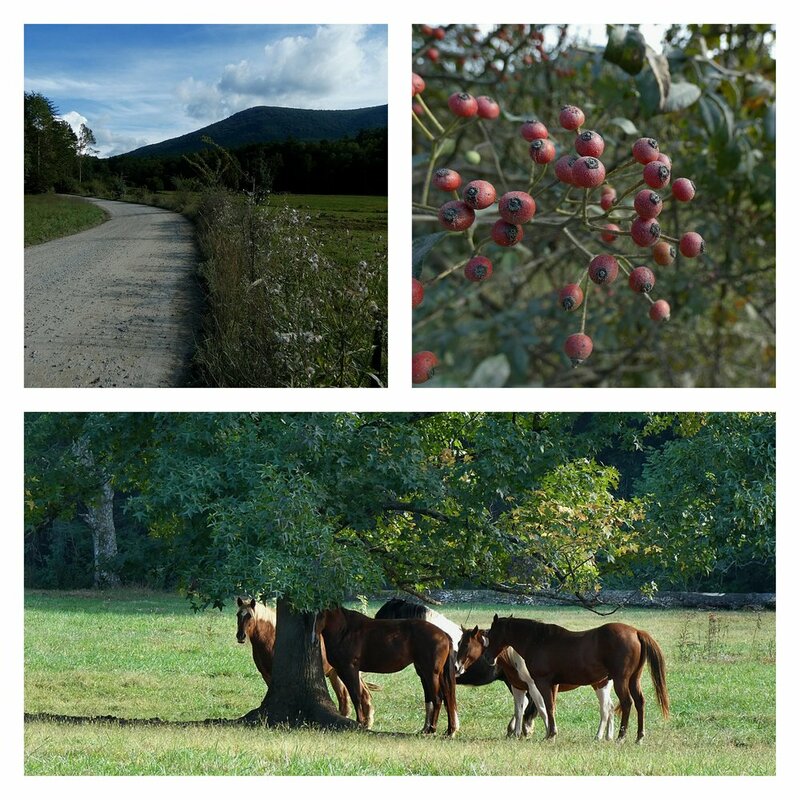 Getting to the trailhead for Fall Branch Falls also requires a fairly lengthy drive on a gravel road, but it’s a beautiful drive filled with horse pastures and rolling mountain views. The falls are reachable after just a short hike from the parking area, so they are very popular. The falls themselves were a little lackluster due to relatively little rain at that time, but the water was pretty and I actually enjoyed the creek more than the falls. Just a reminder to exercise caution when hiking around waterfalls. There was yellow tape up all around the top of the waterfall and some degradation near the sides of the trail. 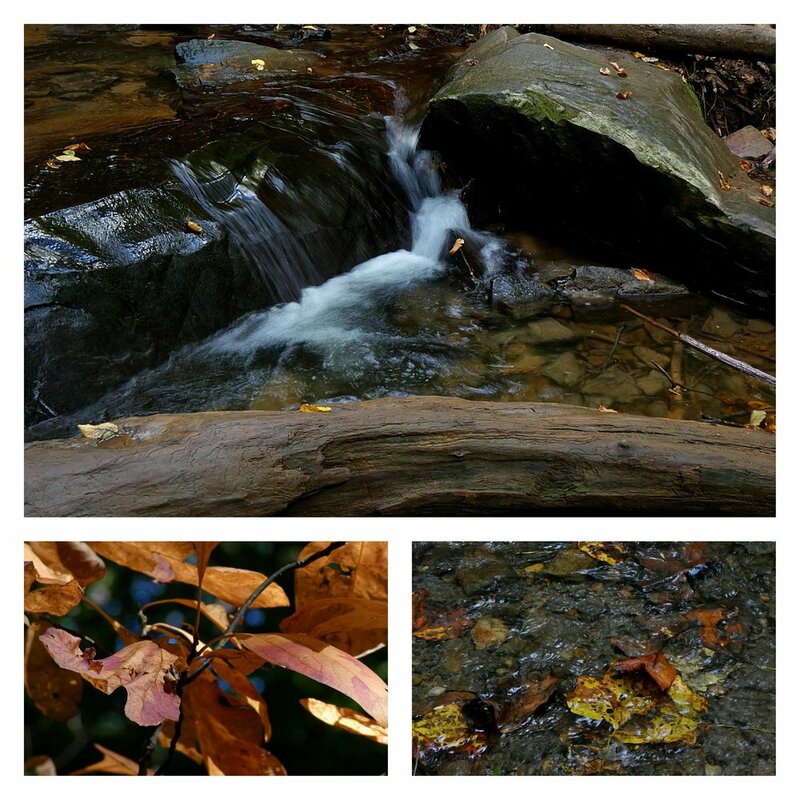 After looking at the waterfall, I then hiked a few miles on the Benton McKaye trail to get a little extra exercise. I didn’t really have much of an objective at this point and there wasn’t really anything remarkable (like mountain views) on this stretch of trail. There was a lot of elevation, though, and the Benton McKaye is a pretty trail in general. So after a long day filled with hiking, I decided I’d better head home so James wouldn’t think I abandoned him. But there is something really nice about being out in the woods literally from sun up to sun down. I wish I could do it every day.